Devoney Looser, author of The Making of Jane Austen, will give a talk titled “The Afterlife of Austen’s Sense and Sensibility” for the English department’s Dean Family Speaker Series October 23, 2018, at 4:30 p.m. in the ZSR Library Auditorium (Room 404). A book signing and reception will follow. Dr. Looser, whose upcoming Penguin Classics Deluxe edition of Sense and Sensibility will be released in November, will talk about Jane Austen’s celebrity and the history of Sense and Sensibility in pop culture, including 19th- and 20th-century print culture, illustrations, dramatizations, and film. Devoney Looser is Professor of English at Arizona State University and the author or editor of seven books on literature by women. Her most recent is The Making of Jane Austen (Johns Hopkins University Press, 2017), which was named a Publishers Weekly Best Summer Book (Nonfiction). Looser’s writing on Austen has appeared in The Atlantic, the New York Times, Salon, The TLS, and Entertainment Weekly. She’s had the pleasure of talking about Austen on CNN and writes occasional essays on professional issues for The Chronicle of Higher Education. Looser, who has played roller derby as Stone Cold Jane Austen, was named a 2018 Guggenheim Fellow to work on her next book on the once-celebrated, now-forgotten sister novelists, Jane and Anna Maria Porter. Devoney Looser’s The Making of Jane Austen turns to the people, performances, activism, and images that fostered Austen’s early fame, laying the groundwork for the beloved author we think we know. Here are the Austen influencers, including her first English illustrator, the eccentric Ferdinand Pickering, whose sensational gothic images may be better understood through his brushes with bullying, bigamy, and an attempted matricide. The daring director-actress Rosina Filippi shaped Austen’s reputation with her pioneering dramatizations, leading thousands of young women to ventriloquize Elizabeth Bennet’s audacious lines before drawing room audiences. Even the supposedly staid history of Austen scholarship has its bizarre stories. The author of the first Jane Austen dissertation, student George Pellew, tragically died young, but he was believed by many, including his professor-mentor, to have come back from the dead. Looser shows how these figures and their Austen-inspired work transformed Austen’s reputation, just as she profoundly shaped theirs. Through them, Looser describes the factors and influences that radically altered Austen’s evolving image. Drawing from unexplored material, Looser examines how echoes of that work reverberate in our explanations of Austen’s literary and cultural power. 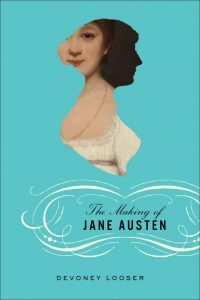 Whether you’re a devoted Janeite or simply Jane-curious, The Making of Jane Austen will have you thinking about how a literary icon is made, transformed, and handed down from generation to generation. The Dean Family Speaker Series is an endowed series that brings nationally and internationally recognized scholars to campus. It encourages critical conversations and dialogue related to the study of English. All talks are open to the public, and everyone is invited to attend.